Lima was founded by the Spanish Conquistador Francisco Pizarro in 1535 after he eradicated the Incas and made the city his capital. Lima has many fine colonial buildings and some of the best museums in South America including the Gold Museum, Museum of the Inquisition and the Catacombs below the San Francisco Church. Peru’s capital has much to offer and many of the sights, including the city’s two main squares the Plaza de Armas and Plaza San Martin, boast some fantastic sightseeing opportunities. The Plaza de Armas houses the Cathedral, Municipal Palace and Presidential Palace where the changing of the guard can be seen every day at 12 noon. There are also many markets in Lima, possibly the best being in the central district. A beautiful colonial city, Arequipa has a lovely central plaza dominated by a large cathedral. There are some fantastic restaurants in Arequipa and it is possible to enjoy many Peruvian delicacies here. Besides the stimulating architecture, one of the the main attractions is the Santa Catalina Convent, which is almost a city in itself with its maze of cobbled streets, cloisters and decorative buildings. Don’t miss the nuns‘ café for excellent freshly baked treats! Another popular attraction is the acclaimed Museo Santuarios Andinos which houses many well preserved mummies. The most famous of the mummies is Juanita, a young Inca maiden who was sacrificed around the year AD 1450 atop the Nevado Ampato volcano to appease the gods and ask for a good harvest. Juanita was sacrificed then frozen by snowfall at the top of the mountain, hence her nickname ‘ice princess’. She was rediscovered in the 1990s when ash from the volcano melted the snow around her. The beautiful scenery continues as you take a combination of buses all the way to Puno on the shores of Lake Titicaca, which at 3,855 metres above sea level, is the highest navigable lake in the world. After six hours of travel, we will arrive in Puno to visit the colourful market here. The next morning from Puno we take a day trip to Lake Titicaca itself. We visit the floating reed islands in the Bay of Puno to see the Uros islanders way of life and we will have the option to ride in a traditional reed boat. Next stop is Taquile Island, an island on Lake Titicaca still holding up many of the traditions values and customs it was built on. Learn about the way of life, from the reasons for why they do their hair the way they do and how they dress. Famous for their textiles and clothing, you will be able to pick up a homemade gift or two from the main square. Today you will journey towards Cusco on a tourist bus. Pass breathtaking Andean mountain scenery on this full day journey. Cusco, which means ‘navel of the earth‘ in the Inca language of Quechua, has a mostly indigenous population of around 300,000 and is centred around the Plaza de Armas, which is dominated by the Cathedral and La Compañia de Jesus Church. Its cloistered arcades house many fine restaurants, bars and shops which you have time to enjoy this evening. A full day is spent visiting the Sacred Valley of the Incas. At an altitude of 3800m we take slow walks that take up to an hour, around each of the ruins in order to manage any effects the high altitude may have. Firstly we visit the Pisac ruins, perched on a hilltop with incredible views of the surrounding mountains. We then go down to the famous traditional market of the same name, which is full of colour and atmosphere. A great place for souvenirs! After lunch, we continue along the valley to the temple/fortress of Ollantaytambo with its enormous Inca terracing constructed on the side of a steep mountain. Tonight you will stay in the town of Ollantaytambo. The Inca were a highly organised civilisation and created many Inca paths throughout the Andes in a network they called Qhapaq Ñan. The most famous of all the paths is known simply as Camino Inca or The Inca Trail to Machu Picchu, the royal route to the remnants of the breathtaking mountaintop city of Machu Picchu. Spread over four days, the spectacular 44-kilometre Inca Trail Trek crosses three stunning high passes and encounters many ancient archaeological sites, culminating at the citadel of Machu Picchu. There are few treks in the world that combine natural beauty, history and mystery with such an awe-inspiring final destination. The Inca Trail Trek can be demanding but can be completed by anyone who leads a reasonably active life – you certainly don’t need to be an athlete. Everyone is able to walk at their own pace and there is no rush to finish. The trekking group is led by an expert local guide and supported by a team of porters and cooks, leaving you with only a small day pack to carry. If you are in any doubt or if you have any condition that may affect your ability to trek, we advise that you consult your doctor. Before embarking on the Inca Trail Trek we will have a briefing to prepare for the next few days and an early departure the following morning. Day 2 Today will be your biggest challenge as you reach the highest pass at Warmiwañusca (4,200 metres) which translates to “Dead Woman’s Pass”! You will cover approximately nine kilometres in about 5-7 hours and after the high pass it’s all down hill as the trail winds its way along old Inca stairs to our campsite. Day 3 On Day three we pass the ruins of Runkurakay, Sayacmarca and Phuyupatamarca, walking approximately 15 kilometres in seven hours. Due to a limited number of people being allowed on the trail a day, permits are limited and can sell out far in advance. If you wish to book the Inca Trail, please provide your Reservations Agent with your passport details by email as soon as possible so that we can secure your permit. Without your passport details, we are unable to arrange your Inca Trail Trek. Please click here for more information. For information on the Lares Trek including what meals are included click here. 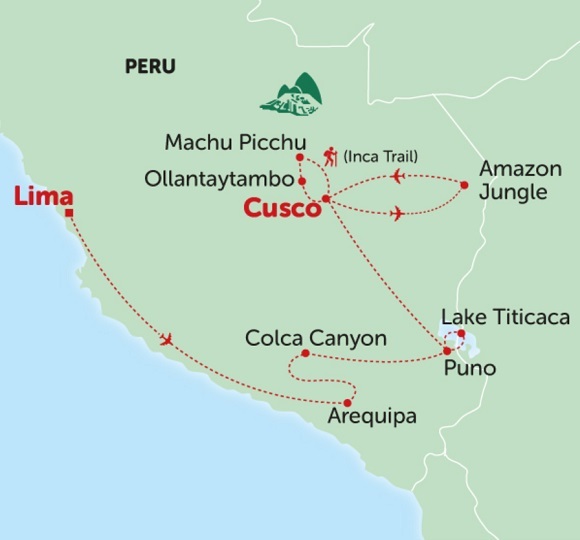 If you are not participating in either trek then you will visit Machu Picchu by train and have plenty of free time to enjoy the activities available in and around Cusco. While the cost of the Inca Trail Trek is included in the price of your tour, tipping is not. The porters, cooks and guides work incredibly hard on the Inca Trail Trek route, carrying food needed for the four days, cooking equipment, tents and your personal items. While it is an optional payment, we recommend a tip of 100 Soles per person to be split between your Inca Trail Trek guides, porters and chefs at the end of the route. Please note: Meals are included for those doing the Inca Trail Trek. If you are choosing not to do the Inca Trail Trek, then meals are at your own expense. 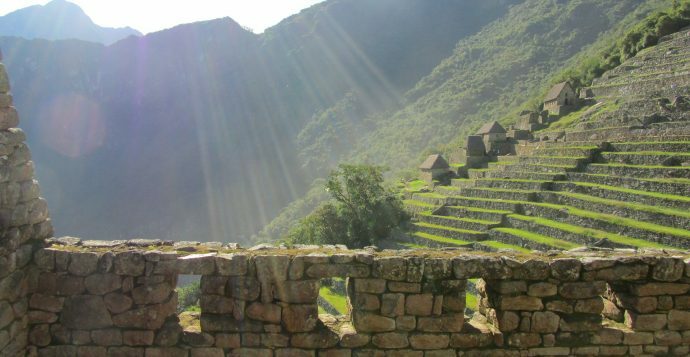 On the last morning of the Inca Trail Trek, after an overnight stop at Wiñay-Wayna, you will rise early for the final walk to Machu Picchu and greet daybreak over the famous “Sun Gate”. There will then be time to explore on your own or simply take in the magnificence of the place after your guided tour. The Lost City of Machu Picchu was originally completely self-contained, surrounded by agricultural terraces sufficient to feed the population, and watered by natural springs. Located high above the fast flowing Urubamba River, the cloud shrouded ruins have palaces, baths, temples, storage rooms and some 150 houses, all in a remarkable state of preservation that will simply take your breath away. The ruins were only discovered by the outside world in 1911, when American explorer Hiram Bingham found them while looking for another “lost city” called Vilcabamba. Due to their isolation many of the buildings are still quite intact and you can’t help but admire Huayna Picchu (“Young Mountain”), which towers above the ruins. After spending most of the day at Machu Picchu you have the chance to meander through the markets of Aguas Calientes before enjoying a scenic train ride back to the Sacred Valley where our transfer to Cusco will be waiting. Today is free for you to explore Cusco. Make the most of your free day to explore its amazing churches, colonial buildings and picturesque streets, many of which have Inca walls, arches and doorways. On a hill overlooking the city stands the ceremonial fortress of Sacsayhuaman, where some of the most spectacular Inca walls can be found, including a massive 130 ton stone. Our Tucan Travel rep will transfer you to the airport for your flight to the jungle community of Puerto Maldonado, the starting point for our visit to the Amazon rainforest. In Puerto Maldonado you can pick up any last minute drinks or snacks in the busy markets and shops. The first leg of our journey is by bus followed by a riverboat, a 35 kilometre journey along the river (approx two hours total). The boats are very safe. Arriving at the lodge located on the river’s edge, you will be allocated a bungalow all of which are built from local indigenous materials. Each room is sealed by meshed netting to keep out mosquitoes and other insects. All rooms have basic private bathroom facilities. Due to the remoteness of the lodge there is limited hot water and drinking water should be purchased. There is also limited electricity so please charge any electrical equipment prior to your arrival. In the evening the lodge and walkways are lit by oil lamps. Other facilities include a welcoming reception area, dining room and bar facilities. All excursions are led by English speaking local guides providing plenty of opportunity to enjoy marvelous jungle landscapes and rich diversity of flora and fauna. After lunch we will set off on a trek through the rainforest along wooden walk ways. On the way our guide will stop to show you various species of bird and explain the medicinal plants and delicate ecological systems of the Amazon Jungle. The scenery is extremely varied incorporating dense jungle as well as marsh areas. You will see incredibly big trees, several metres in diameter and around 450 years old. We walk to Cochita Caiman (Caiman Pond) where we see wildlife along the way. We then return to the lodge for dinner. After an early breakfast we hike deeper in to the jungle, enjoying the surroundings and exploring the delights and hidden wonders of the Amazon Rainforest. We may also catch a glimpse of the rare giant otter. Afterwards we will enjoy the view of the lake from our viewing point/observation platform, where you can experience the canopy wildlife such as parrots, guacamayos, toucans, camungos, shanshos, herons, turtles and caiman. We will return to the lodge for a well deserved lunch. After lunch, we take a short boat trip across the Madre de Dios River to Monkey Island. On the way over you may spot caiman from the boat. Once on the island it is possible to see a great variety of monkeys such as the ‘maquisapa’, black and white ‘Martins’, ‘Leoncito de la Selva’ (Little Lions), ‘Frailes’ (Friars), ‘Achuñis’, ‘Ronsocos’ as well as an array of birdlife. In the evenings it is often possible to enjoy the wonderful sunset, one of the most impressive sights of the forest (weather permitting). Waking up to the sounds of the jungle, take the boat back to Puerto Maldonado for your flight back to Cusco. You have the remainder of the day to pick up any last-minute souvenirs before your adventure comes to an end. Optional excursions – On each trip, you may find there are some excursions that are not included. This might be because they are not to everyone’s taste or there may be various options of differing value to choose from. More information on the excursions we recommend is listed under each day of your itinerary though prices may vary. If you are after something in particular, don’t hesitate to ask your tour leader. Diese Tour startet mehrmals im Monat und beinhaltet 9 Nächte in Hotels, 3 Nächte Camping, 2 Nächte in einer Lodge.